Firstly, I want to point out how much I love this particular cover of the book. 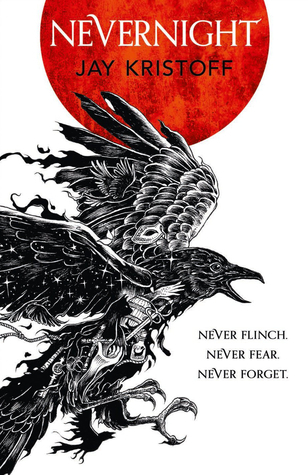 The images match exactly what you will find written on Nevernight’s pages. It’s the same as the one sitting on my beside table. The plot was intricate, with the Mia’s original goals leading her to the Red Church, a place where she could hone her murderous skills. The mysteries and challenges she faced kept me turning the pages. I suspected things weren’t all as they seem with some of the other ‘acolytes’, but I couldn’t guess the twist nearer the end. I don’t really want to say more than that because I don’t like giving away spoilers. The only slight niggle I had with the reading was the additional footnotes. When they were short I read most of them, but if they moved onto a second page I mostly skimmed. This may just be because I’m impatient and it felt a little like having an ad break in the main story at times. Now that I have finished, I will most likely go back and read it again more slowly and to absorb all the footnotes properly. I wish I had picked Nevernight up sooner. It was an enjoyable read. While this is listed YA, and the majority of the characters are young, the themes are definitely mature. I recommend it to lovers of fantasy who don’t mind a bit of bloodshed.